Jordan Shipley has been busy preparing for the holiday season. The former NFL wide receiver is using the same determination, field awareness, and work ethic that made him such a force on the field to launch an innovative holiday-themed marketing hook for his next big project: elk melk. By the time Jordan’s done, the world won't think "Christmas" without thinking "Melk." Jordan was able to make time to catch up with us to discuss the ambition of his latest business venture. Q. Where do you see MELK in 5 years? A. I see MELK as a household name brand in five years. It has to be. People would have never thought to throw away a handkerchief after one us. Boom, Kleenex is everywhere now. MELK will be the Kleenex of the dairy world. P.S. - handkerchiefs are just nasty. Q. Who would you say is your biggest competitor? A. Almond milk is having a good run. Soy too. Even rice milk has a following. But they’re all vulnerable. The fact is that MELK is a better quality milk experience. The smooth, lumpy mixture combined with the crazy amounts of gritty protein puts MELK in its own class. Our biggest competitor is ourselves. We’d be doing the public as disservice if MELK weren’t taken to the masses. A. Gary Vaynerchuk, Oprah,… that’s about it. A. Gotta be on both, but I Snap all day. Mainly selfies with me and Bessie, our top producer. The millennials are way into MELK. Incredible engagement when we draw MELK mustaches on the elk in our snap stories. Gets 'em every time. Q. Who is the ideal MELK consumer? A. Millennials with jobs, who consider themselves active by their recreation sports participation, don’t have any connections to the health code, most importantly they enjoy diverse mammal dairy options. Very similar to the craft beer consumer, but really into dairy products. So yeah, basically Portland. Q. Glass or plastic bottle? A. Of course. Lots of people. All of them. I take that title seriously, so much so that I almost turned down the nickname out of respect to our vision. I didn’t want to make light of what we’re after – global dairy dominance. We won’t stop until the world is fed. Q. What is Melk is best paired with? A. Chicken fried steak. A rich meal like that deserves a full 12 oz glass of MELK to wash down the fried deliciousness. The thickness really cleanses the palate and helps you enjoy a chicken fried steak to its full potential. 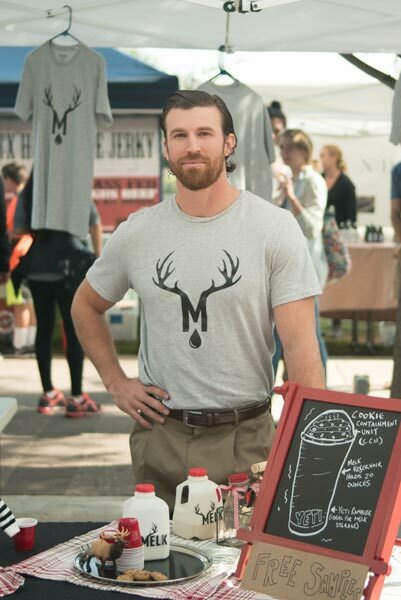 Jordan Shipley, AKA “The Melkman,” has a brilliant marketing plan for the spork of the beverage industry. Jordan Shipley has been busy preparing for the holiday season. The former NFL wide receiver is using the same determination, field awareness, and work ethic that made him such a force on the field to launch an innovative holiday-themed marketing hook for his next big project: elk milk. By the time Jordan’s done, the world won't think "Christmas" without thinking "Melk." YETI talks shop with MELK founder Jordan Shipley. Some refer to Shipley as the next Louis Pasteur, while many others are less hopeful. Check out Jordan’s vision for the next dairy sensation as we grill him on his strategy to bring MELK to the masses. A. I see MELK as a household name brand in five years. It has to be. People would have never thought to throw away a handkerchief after one use. Boom, Kleenex is everywhere now. MELK will be the Kleenex of the dairy world. P.S. - handkerchiefs are just nasty. A. Almond milk is having a good run. Soy too. Even rice milk has a following. But they’re all vulnerable. The fact is that MELK is a better quality milk experience. The smooth, lumpy mixture combined with the crazy amounts of gritty protein puts MELK in its own class. Our biggest competitor is ourselves. We’d be doing the public a disservice if MELK weren’t taken to the masses. A. Gary Vaynerchuk, Oprah… that’s about it. Q. What is Melk best paired with?